Profile from Leonardo Electronic Almanac, Aug 2012. Chris Meigh-Andrews’ art practice involves moving image installations that aspire to create links between aspects of location, history, technology, landscape, ambient conditions and natural forces. Over recent years he has produced a number of digital video projections and site-specific installations that explore the relationship between iconic or historical photographic images, people or locations and contemporary views, perspectives and visualizations. His approach seeks to reproduce an exact framing and composition based on an historical photographic image and to explore ideas suggested by establishing relationships between the composition of the original and the present circumstances of that same view. Meigh-Andrews’ latest project is a site-specific, web-based installation on the grounds of Down House – the family home of naturalist Charles Darwin – in Kent, England. This project takes as its focus an old mulberry tree growing at back of the house, which serves to represent the relationship between the domestic life of the Darwin Family, the garden as a site for Charles Darwin’s careful and systematic observation of natural processes that he drew on in developing his theory of Natural Selection, and the slow but inevitable change in the cycle of life and the seasons. The work has been developed by the artist with the collaboration and assistance of Alan Summers (University of Chester) and Rowan Blaik (Head gardener, Down House). Dziekan, V.L., Meigh-Andrews, C., Blaik, R., Summers, A., 2012, Interview with Chris Meigh-Andrews, ‘In Darwin’s Garden’, Interview, Leonardo Electronic Almanac Digital Media Exhibition Platform, online. Over the latter phase of the online exhibition, ‘In Darwin’s Garden’, we spoke with Chris Meigh-Andrews about the genesis of this project and its place within the lineage of his art practice. Joining us were two of his collaborators, Alan Summers (University of Chester), and Rowan Blaik, Head Gardener of Down House for English Heritage. The following conversation was conducted via LEA’s digital media exhibition platform on Facebook between 19 August to 3 September 2012. Archived version can be found at: [http://bit.ly/InDarwinsGarden]. VINCE DZIEKAN (VD). Chris, I’d like to start our conversation by referring to two images that recently served as the lead-in to our presentation of your latest project, which is taking place (literally) in Charles Darwin’s garden at Down House in Kent. One is a drawing from the mid-1800s of the rear of Down House and its garden; the other a contemporaneous snapshot of the same view. Encapsulated in the simple juxtaposition is what appears to have been an enduring preoccupation of your practice: the way that representational images open up a particular relationship to space and time. To set the scene for further discussion, I thought it would be useful if you could initially speak to the way that you believe still images relate to our understanding of temporality. CHRIS MEIGH-ANDREWS (CM-A). It is a very good place to start, because as you say, a fascination with temporality and its relationship to space is right at the heart of my practice-even the earliest videotapes, such as Horizontal & Vertical (1979) and The Room with a View (1982). We are suspended in time the same way that fish are suspended in water- it’s our primary medium. The way we have come to understand consciousness is inextricably bound up with temporality- we anticipate, plan, remember, and reflect. Temporality is directly involved in our sense of place too, not only in terms of physical movement- speed, pace, etc. but via history- the significance and power of a particular place. We have developed technologies to explore and enhance our participation with and engagement in time- photography freezes it, capturing momentary experiences and holding them for contemplation. The cinema, which of course is a development of photography, provides us with an even greater range of methods to explore and celebrate our preoccupation with temporality- movement, of course, but also time-lapse, slow motion, freeze frame and the “real-time” gaze of the video surveillance camera. On reflection I think that my fascination with photography has always been in relation to cinema, to the way in which these two interrelated media shed light on the processes of spatial perception, memory and time and their relationship to consciousness. Many of the cinematic works by other artists that have profoundly influenced me have directly engaged with these key themes: Mike Snow’s Wavelength, Chris Marker’s La Jetee, Steina and Woody Vasulka’s Time-Energy Objects, Andrei Tarkovsky’s Mirror, Powell-Pressburger’s A Matter of Life and Death. VD. You mention “real-time”… so I wonder if you might expand on how you’ve approached it in your work (as concept, construct or trope)? It seems to me that your use of the notion of “real-time” is both narratively inspired as much as technologically enabled in terms of information communications technology. I’m thinking particularly of an earlier work of yours, For William Henry Fox Talbot (The Pencil of Nature) which installed a transmitted image of Lacock Abbey in the V&A galleries alongside a copy of Fox Talbot’s treatise on photography, but also how the narrative aspect of “real-time” is taken to its logical extreme in Christian Marclay’s The Clock, which won the Gold Lion at Venice last year. VD. You mention using “renewable” technologies in some of your installations to highlight the fluid nature of energy and, by extension, as a means of relaying ideas about the flux and flow of perception and temporality. Could this also relate in some way to the choice of Darwin’s garden as setting for your current project? In particular, I’m thinking about how the mulberry tree plays the protagonist’s role in this work and that by featuring it in this manner creates a very direct, immediate and tangible continuity between its contemporaneous existence (now) and its connection to the past (which is reinforced by your choice to extract a passage from Darwin’s grand-daughter Gwen’s memoirs, but also, of course, as represented by the nostalgic tonality of archival photographs)? CM-A. My interest in the garden as the subject for a new piece came first. As I have said, the significance and resonance of specific places and locations is an important aspect of recent work- the oriel window at Lacock Abbey (For William Henry Fox Talbot), Ruskin’s view of Coniston Water (Interwoven Motion), the city of London from Wren and Hooke’s Monument (The Monument Project, 2009-2011) are recent examples, and I wanted to continue exploring and engaging with locations that had strong associations with cultural history. When I approached English Heritage about Down House, I just knew that I wanted to return to the landscape after working on the Monument in the centre of the city for 3 years, but it was only through an exploration of the wonderful garden at Down House and discussions with Rowan Blaik (who is the Head Gardener at the house) that I discovered the Mulberry tree and it’s provenance. The tree was there when Charles Darwin bought the house and throughout the forty years that he lived there (1842-82). I feel certain that he would have enjoyed it every day and in every season whilst living there- it is a living link with the past, and through that connection there is a tangible nexus with the history of ideas, to science, and to the development of theories that have profoundly shaped our sense of what it is to be human. As the tree has continued to grow and change over the centuries it has reflected the cycle of seasons and the pulsing flow of living things, and for this reason I chose to put the tree at the centre of this new work. ROWAN BLAIK (RB): My aim in managing and curating the garden is not only for it to be as faithful historically, horticulturally and ecologically to when the Darwins lived here, but also to preserve and present its intangible qualities, its genius loci – not just a place of scientific observations and discovery, but also the garden as a charming, private, fun, inspiring family place. Any artistic interventions in the landscape had to convey these values as well as to be sympathetic to the constraints posed by working in a significant heritage site. I was already familiar with Chris’s work on The Monument Project so appreciated his understanding and attention to detail when collaborating creatively with such unique sites. When Chris approached us with initial ideas about the project, the mulberry tree quickly stood out as the perfect subject for the piece. The tree tells us more about how the Darwin family, and subsequent residents, interacted with the landscape than any other remaining part of the living landscape. The ‘old tree’, as they described it in 1842, was immediately liked by the Darwins and has come to embody so much of the character of the garden. Recording long-term time-lapse footage simultaneously from multiple viewpoints has been very practical to implement and discrete in its execution. It has captured the gnarled skeletal structure of the tree at a key stage in its decline towards the end of a long life (additional bracing appears part way through the footage as an aged limb breaks out from storm damage for example), the dynamic subtleties of seasonal plant growth and the seasonality of its setting, together with the movement, curiosity and enjoyment of the public as they visit the garden. The finished piece will form another layer in the rich archival and artistic understanding of the site, and to ongoing innovations in how the site is interpreted to our visitors. VD. In Darwin’s Garden (as the latest of Chris’ webcam or relayed transmission works) intriguingly seems to take the momentary and turn it into something more enduring. Beyond that temporal aspect, though, your last comment, Rowan, makes me think about archival “layering” and how digitized information now serves as some kind of “digital sediment”. This makes me think of Stratigraphy, the geologist Charles Lyell and his formative influence on Darwin. As I understand it, a central argument of Lyell’s ‘Principles of Geology’ was that the present is itself a key to unlocking the past. I’m wondering if you have anything to add about how intangible cultural heritage has influenced the way English Heritage is operating today, and whether there have been any other interventions in historical sites that you believe have been particularly transformative in this regard? RB. Darwin actually saw the layering you mention beneath the roots of the mulberry tree itself. The garden well, bored through the chalk bedrock below, is situated beside the tree and Darwin often saw fragments of seashell in the water buckets where they had “occasionally dashed against the side of the well”, so he could observe the age of the earth right from here. Regarding your question of intangible heritage – from a gardens and landscape point of view, very much so. English Heritage has a very diverse range of site in its guardianship. Some sites may have fantastic heritage value, but have lost their original spatial or cultural context. Instead of leaving these sites isolated from people or place, where possible (when heritage protection/archaeological restrictions allow) EH has sought to add contemporary gardens into the landscape through panel selected design competitions. Since 2000 our ‘Contemporary Heritage Gardens Scheme’ has helped improve access, enjoyment and understanding of the landscape and to reconnect people the sites history. One specific example of the six garden so far completed, in Richmond Castle, Yorkshire, includes abstract topiary elements to represent the 16 ‘conscientious objectors’ who were imprisoned in the castle during the First World War. Another example, the addition at Witley Court, Worcestershire, of a ‘wilderness garden’ for performance, play and the display of modern sculpture. A key aim of all these sites was to leave the next ‘layer’ of good design on the landscape. EH is also a major partner in the HBGBS training scheme to pass on traditional horticultural skills, that heritage gardens require, to the next generation of gardeners. As well as other EH sites taking part in this national scheme, our last three garden trainees at Down have been part it. CM-A. Yes, I love the idea of the various kinds of co-existent layers that can be experienced in the garden. This is enhanced by the fact that Darwin was well aware of this layering of information and witnessed it first hand in the domestic setting of Down House. I’m interested in representing and making connections to the stratification of shared ideas, lives and perceptions that can be referenced and explored through the site and its location, and hope that the new work will be able to enrich and enhance that experience. I also feel very in tune with your concept of the “digital sediment”- the record of transient moments, fleeting gestures and brief interactions building up in layers that may be excavated and investigated and that might potentially add to the wealth of meaning and possibilities that the site offers to those who visit. VD. This leads me to ask you finally about what appears to be a new extension to your practice, Chris: the introduction of 3D visualization. I’m curious about how processes like data visualization and 3D imaging and animation add another layer of digital sedimentation designed to support the quest of cultural heritage to no longer (simply) archive and document a site for posterity, but to provide means of re-engaging and even re-animating them in the future. 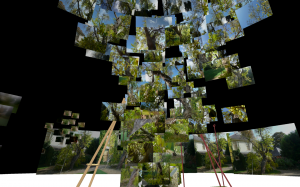 I hope that you and Alan Summers – who is collaborating with you on modeling the mulberry tree from the resulting collection of image data that you have harvested over the past year – might give us some additional insight into how this particular idea developed, the challenges it is presenting and where it seems to be heading? CM-A. I have always considered my video installation work to be “sculpture”, and the notion to develop a new work using 3D visualisation seemed a natural extension and progression from previous work, and deeply related to the fact that the mulberry tree is itself a growing, living organic structure. As with a number of my early video tapes such as Horizontal & Vertical (1979) and An Imaginary Landscape (1986) as well as sculptures from the 1990’s including Eau d’Artifice (1990) and For John Cage (1995), recent installations such as The Monument Project (2009-11) and Interwoven Motion (2004) involved looking out from a central point at a view or vista, but in this new piece the images being collected are from cameras that are looking towards and around the subject of attention- the ancient tree. Having decided this approach was central to the way I wanted to develop In Darwin’s Garden, I contacted Alan because of his specialist knowledge and recent PhD research into 3D rendering and game engines. In our most recent discussions we have developed ideas for two related works- a web-based, 3D time-lapse piece that could be presented in a gallery, and an augmented reality sculptural installation that would involve the use of ipads and/or smart phones to engage with the work. As Rowan has mentioned, the old tree is now in its decline, with man-made structures supporting some of its branches. We would like to make full-size facsimiles of these structures to use as a foil to the virtual image of the tree and develop a work that would enable visitors to explore the tree in virtual space and time. There are also some additional possibilities that we are considering for the on-line version which involves the development of a “narrative” dimension that would reflect the seasonal cycle of the year by introducing the human figure as an active element, with four brief actions to represent the way in which people have engaged with the tree throughout its long life. At this stage in the discussion, we prefer the tree to be presented as a free-standing structure, but because of it’s historical connection to the adjacent house, it would be interesting to provide occasional images which include the house- to perhaps to allow it to flicker in and out at times. All of these ideas are at the developmental stage, and once the image collection phase is complete, which will be around the end of Oct, we will begin to explore them in more detail and develop the work in consultation with Rowan. ALAN SUMMERS (AS). When Chris first approached me and informed me of the time based photography and his thoughts for the piece, digital artifacts where trees are the underlying structure for information or a generalized aesthetic reference, such as Ecotonoha by Nakamura, came to mind. On speaking in more detail with Chris and viewing the images of the Mulberry tree it was evident how much personality this tree has within its natural form and through the man made structural interventions over its lifespan. It became obvious that this could not be modeled using a generalization of natural forms but needed to capture the individuality of the structure of this ancient tree. The challenge then was how to form a three-dimensional structure using the time-lapse imagery that creates the vision Chris has of allowing you to experience the individual form of this ancient tree and the layers of context surrounding it. Three-dimensional space enables us to spatially locate the layers of imagery around the space the tree would fill forming a structure that interprets the physicality of the tree. In a game engine we can give the viewer full control over their exploration of the subject matter so using technological windows people are happy to view information with, web interfaces, i-pads or smartphones, means people can more ‘naturally’ engage with this form and experience these layers at an individual level. The installation using augmented reality means you will experience the natural layers digitally but they spatially reference the life size tree while you move around the physical structure of the man made supports. The physical void in the structure left by the tree now in the final stages of its life just adds poignancy. There are plenty of technical issues still to consider with both versions at this early stage but most importantly for me we have a structure that meets Chris’s vision and allows for the further developments he mentioned. VD. The possibilities you both outline for further development sound fascinating. I love the idea (alluded to by Chris) where you mention the introduction of a variable dimension to reflect seasonal change as well as the introduction of active human figures to represent how people have interacted with the tree over its life span. I can’t help but think of the “virtual sculptures” of John Gerrard in this regard. An early piece of his, Smoke Tree (2006), even focuses upon the central motif of an oak tree that transforms over the course of a day, programmed to sync with real-time. The extended time frame of some more recent works (such as Oil Stick Work (Angelo Martinez / Richfield, Kansas) where its simulated character Angelo Martinez will only complete his task of painting the side of a barn in the year 2038!) point towards a different way of conceptualizing the durational aspect of an artwork and to how a “model viewer” is expected to not only engage with this kind of expanded narrative, but also develop an emotional connection with the content of its representation on other levels. CM-A. Yes, I think there might well be a connection to Gerrard’s interest in the significance and relationship of site and location and with an exploration of the potential of the digital moving image to produce an artwork that really engages with the possibilities of virtual (and temporal) space. As mentioned previously, I have been very interested in the spatio-temporal possibilities of video for some time. For example my installation Eau d’Artifice (1990), which is a fountain constructed from 35 video monitors, “performs” the fountain over the course of a compressed day, with the quality and colour of the water changing over the duration of its cycle. Unlike Gerrard, I have not made works that synch with real time, but I do share an interest in developing work that directly engages the viewer in an active awareness of the act of perception. In Darwin’s Garden will be a new development for me, because up until now I have not really explored the potential of 3D imagery, nor attempted to enable the viewer to physically engage with a work that resides entirely in virtual space. As Alan has stated, there are still a number of technical (and aesthetic) as well as practical issues to resolve, but the opportunity of working with Rowan and Alan and the challenges and rewards of developing a new work that is associated with this historic location is exciting and compelling.